Would this fit in my car I have a 2002 wrx that has sti intercooler and sti turbo with external wastegate and 1000cc fuel injectors. A: Unfortunately, Cobb only confirms fitment on the 2008+ STI models. A: I have it on my 2004 wrx. Works great. I dont have the external Watergate though. will it fit my 13 wrx? I have a 2016 sti I have the Perrin intake and bov and fmic and catback exhaust tuned on stock internals running great would this turbo work good in my car? Also what other parts would I need for quick install? Thank. You for your time..
A: Great question! This would be perfect for your vehicle but you would want to do some fuel upgrades with this like injectors and fuel pump. Give us a call at 1-888-45-Rally and we can get you the items that would work for this! Will I be ok running the stock turbo inlet with this turbo? And it will fit no issues correct? 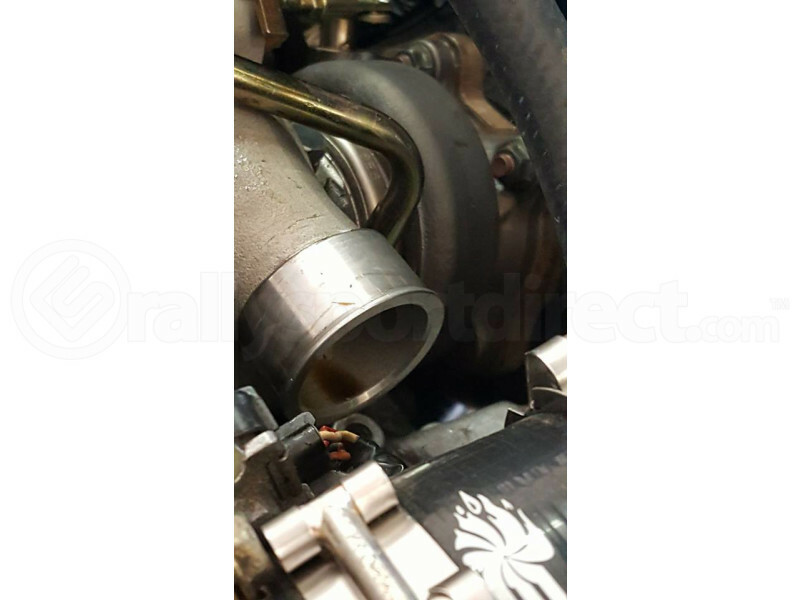 A: The stock turbo inlet will install and work fine with this turbo but many choose to upgrade to a silicone option while they are doing the the swap. Will this turbo fit in a 2005 Subaru STi? Also, is it safe to run on stock internals? A: Unfortunately, this is not confirmed to fit your vehicle. As far as running a 20g on stock internals; with a safe tune it would more than likely be safe but it really depends on the health of the motor itself. A: This would be a direct drop in for your STI but you would need professionally tuned for it. Here's an answer and question. Yes it bolts up just fine for an 06 STi for all you guys asking. My question is...Does it need a restrictor? I'm getting oil on the outlet side of the turbo and puffing a bit of smoke. I know it's in our subaru's nature to burn a little but curious if either the new turbo has bad seals or possibly getting too much pressure. I'm also not running a catch can or AOS yet. Will update after my catch can is installed. A: This does not require removal of the boost pill, you'll more than likely remove it if you step into an EBCS however. We strongly recommend running an AOS or Catch Can system on your Subaru, especially with an aftermarket turbo. A: Ended up having cracked ringlands (go figure). Pressurized my oil pan and blew oil out everywhere. Catch can filled almost full after 3 pulls. IAG closed deck block, cams, springs, retainers, clutch in now. Breaking it in. Can't wait to finally push this turbo to the limit. Will this work on my 2014 Subaru wrx. I have a fmic , turbo back exhaust, intake. Bov. Stage 2 clutch. Cobb Ap. Will I just need a pro tune? A: This could fit your WRX, but it might require some modification for it to fit to your car. And you will need a pro tune. would bolt right into my 09 wrx ? and what mods would I need if so to run this turbo? A: I would run intake, Turbo back exhaust, intercooler, fueling, and a good tune. I have a 09 Subaru WRX will this Turbo fit and if so what other mods would I need if I got this turbo. I have now a full SPT exhaust . A Perrin cold air intake . Stage 2 clutch. A: This turbo is not confirmed to fit your car. You will need a WRX or Legacy style turbo. 06 wrx tr if I already have a conversion for the vf48 would this turbo be a direct fit minus a retune? A: We don't have it confirmed for your vehicle, but this turbo should bolt up without any issue and you will need supporting mods and tune after installation. Does the turbo come with the bolts to attach the down pipe or do i have to purchase that seperate? A: You will need to purchase the bolts separately. plzzzz help does this turbo fit my sti 2008 ? I have a stock engine OEM and injectors 1000cc and after market intercooler what should be maximum boost for this turbo? taking as a consideration top end speed and engine safety!! A: This turbo will fit your car. The peak efficiency of this turbo is around 24 PSI. Exact pressure will be determined by your method of tuning. Would this fit my 2016 STi? On Cobb's website it says 08+ but it doesn't specify that it ends at 2014 like it does here. A: This turbo is not confirmed to fit your car by Cobb. While it would likely bolt on just fine, we cannot say for sure. It says that it's not provided, does that mean i have to get my own or that they didnt give you that information? A: It says Not Provided under cartridge because Cobb does not specify any information about the cartridge. This is a complete turbo. Does this turbo come with all necessary installation hardware? States oil line is not included, so will the factory oil line be a direct fit? A: This turbo includes the Upper Uppipe gasket, Turbo to downpipe gasket, and hosing. Hardware must be purchased separately or reused from your current turbo. Will this work on my 2013 wrx? Its not a sti. If yes then what injectors are suggested? A: This will not be a direct fit for your car. You would need the Process West Verticooler with the Traditional Turbo Upgrade Hose in order to run this turbo on your car. Injector size will vary depending on the fuel used. 91/93 Octane would require 850cc injectors, and 1000cc injectors are recommended for E85 applications.